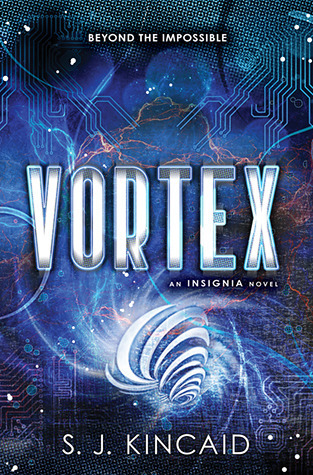 Vortex follows the story of Tom Raines, a newly promoted, mid-level cadet in training at the Pentagonal Spire. Tom trains with his friends, Wyatt and Vik, and his other friend Yuri is still running the halls of the Spire. But this year, Tom has downloaded new information to update his neuro-processor, meaning that Tom gets to experience and train with new objects, see different areas of the Spire for what they truly are, and, most importantly, embark on new adventures. But when Tom senses "Medusa" in one of his flight sims, the only thing that she can spell is trouble, and Tom has no choice but to get involved and see what the future might bring. Overall, I actually really enjoyed this story. I loved being able to see Tom grow as a character and have his morals and loyalty to his friends being constantly put to the test. I did not read the first book in the series at the time of writing this review, so I loved being able to see the different sides of Tom and the hints at his past that Vortex had to offer. I thought that there was a huge amount of contrast between Tom's life at the Spire, and Tom's life with his father. Tom would either be helping his father to gamble, or he would be training with the Exo-suit. When Tom was in trouble, he would either hit someone with a napkin dispenser, or he would go after their neural processors. I loved seeing the point in this book where both his "normal" life and his "Spire life" blended together and created a very unique set of situations that Tom had (and still has to) deal with. The only problem that I had with this book is that, for me, it was very slow moving in the first half of the book. I had trouble picking up the book time after time and understanding what was happening. I understand that part of this was from the lack of my knowledge from the first book in the series, and once I read the first book I would love to edit my opinion on the matter. However, I do believe that most of this came around the description of the flight simulations and *spoiler* the battle that Tom and Medusa had during that part in the book. *end spoiler*. Maybe this was just because of the word choice and language, but at that point in the book, it lost me and I was just confused. I was debating skipping over this entire section because I was not really sure if I would be able to pick it up again. However, I am so happy that I continued to read the book and did not skip any part of it. As soon as I finished reading the first part of the book, where I was generally confused, the plot picked up and thickened. I had a very hard time putting this novel down. I was so happy that I was able to learn the intentions of every single character and to see how the decisions of each character and events prior in the plot were able to play out. Characters that I never thought I would like grew on me instantly. Characters who I had no background information on, I was able to learn more about just within a chapter or two. Every reader can connect with these characters. One of the characters that really hit me hard was Blackburn. (There may be spoilers in the next section of this review, so please be warned). In the first part of the book, Tom portrays Blackburn as the enemy, a narcissistic person who does not even deserve to live because of the crime he committed. Tom is angry when Blackburn even attempts to talk to his friend Wyatt, and becomes infuriated when Wyatt takes his side on several issues. S.J. Kincaid has a talent for characterization. There were certain points in the book that I even wanted to turn away from the book because I thought Blackburn's demeanor was that unbearable. But that is a good thing! As the story progresses, the reader learns that *spoiler* Blackburn is really just looking out for Tom and does not want him to get into trouble. Blackburn's true intentions are never revealed directly to Tom, until the very end of the novel. Tom never knows that Blackburn is a person with good intentions until the very end of the novel *end spoiler*. This change in character is reflected throughout the writing style of Ms. Kincaid and the understanding of Tom himself. Ms. Kincaid's writing style is nothing short of unique. With one sentence, Ms. Kincaid is able transform a character and completely change the plot. That is true talent. My overall rating for this book is around four stars. I thought the first part of the novel was very shaky and nothing that I was expecting. However, the second part of the novel made up for this tremendously. I never knew what was going to happen with each turn of the page, and that is what makes this series such a great read. I cannot wait for Catalyst (the third book in the series) to come out later this year. For anyone that is looking for a new sci-fi series, this might be just the one that you are looking for. I received this book from the Goodreads First Reads promotion. Congrats ! (: I nominated you for the Liebster Award ! :* All the info through the link :D http://threecheers4butterbeer.blogspot.com/2014/09/the-liebster-award.html I Hope you'll do it !